Can you run it up and down the slope or would you always be going cross slope. My worst bank is about similar to this and looks just as wet for most of the year. Certainly a "+" for the Stiga. 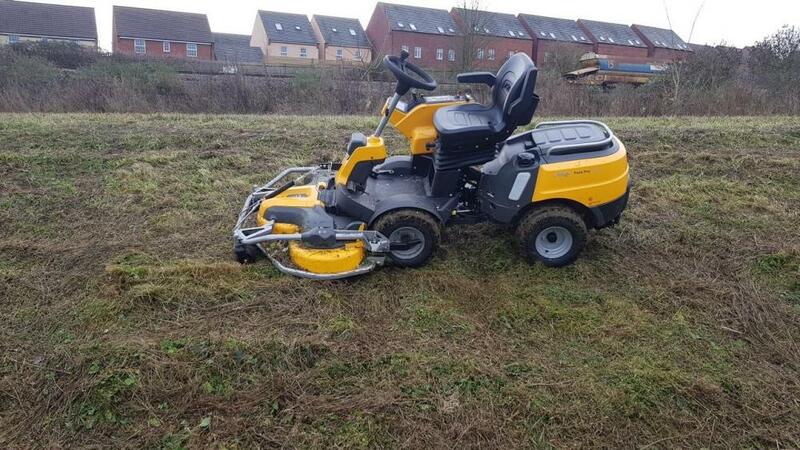 I had a grounds maintenance contract for 3 years where we used a pair of Stiga Park Pro 4wd's. There were excellent in practically every way. Fast travel when mowing unless grass very long (our contract was fortnightly mowing), very fast between mowing areas(the Countax was a snail by comparison when going from one zone to another). Manoeverability was brilliant, petrol consumption was fine. Considering there are a domestic spec machine they withstood commercial use surprisingly well. The only real problem was the belt linking the two front blades, as this had to be a toothed belt so the blades were always in phase with each other. No problem on my own lawn, or on the better maintained parts of our contract. On areas with long grass I got fed up with residents leaving their dogs' sticks and stones in the grass - you couldn't see it until too late and the belt would snap. Took me about 20 minutes to change a belt once used to it, always carried spares with me. Belts were 315-20 a piece if I remember correctly. If we did the same work again I would certainly use the Stigas again.